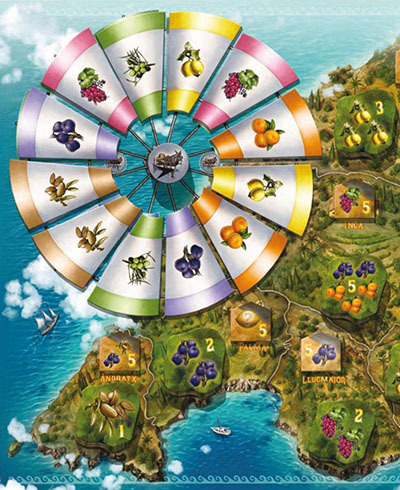 The players take the roles of Mallorcan farmers, who strive to harvest as many of the island's tropical fruits: figs, almonds, olives, oranges, grapes, and lemons, as possible. The players deliver their harvested fruits to the island communities, which have constantly changing requirements during the course of the game. For these deliveries, the players receive victory points. In the end, the player with the most victory points is the winner. Shuffle the 12 windmill blades face-down and place them face-up on the spaces of the windmill. Shuffle the 42 fruit tiles face-down. Then separate them into 10 stacks of 4 each. Place one stack in each region and turn the top-most tile face-up. Place the 2 remaining tiles face-down in the box without looking at them. Randomly distribute the 10 finca tiles, 1 per region, on the community in each region. Sort the 108 fruits according to type and place them as general supply next to the game board. Each player takes the 4 action tiles in his color. Place the 4 bonus tiles in a stack beside the game board. Place the tile with the golden 4 on the bottom, then comes the 5, and then the 6, and, finally, on top is the 7. •. Place the donkey carts in a stack in the middle of the windmill. The play begins with the introduction phase. First, the players choose a starting player. He begins the game by placing one of his farmers on any windmill blade and taking exactly one fruit from the supply that matches the fruit that is illustrated on that windmill blade. The players follow in clockwise order. Each sets one of his farmers on any windmill blade and takes exactly one fruit from the general supply matching the fruit illustrated on the blade where he placed his farmer. Several farmer figures may be placed on the same windmill blade. The introduction phase ends when all players have placed all of their farmers and received a fruit for each one. The players place the fruits they take visibly on the table near them (their play areas). This open showing of taken fruits continues thrughout the entire game. Example: Red places his farmer on a windmill blade illustrated with a lemon and takes 1 lemon from the supply, placing it in his play area. Next Yelllow places his farmer on a blade with a fig and takes 1 fig, placing it in his play area. Then, Blue places his farmer next to red's farmer on the windmill blade with a lemon and takes 1 lemon, placing it in his play area. The player selects any one of his farmers which is on a windmill blade and moves it in the clockwise direction. Before moving his farmer, the player counts the number of farmers on the blade he is moving from (his and his opponents). He then moves his farmer exactly as many spaces (blades) as there were farmers on the blade he moved the farmer from. Thus, if a farmer is alone on a blade, he moves only 1 space - to the next blade. If the farmer shares the blade with one other farmer, he moves 2 spaces (blades). And so on, for 3 or more farmers on a blade. After the player moves his farmer, he counts the farmers (his and his opponents) on the windmill blade where he ended his move. He then takes this number of fruits from the supply, placing them in his play area. The kind of fruit taken is shown by the illustration on the blade where he ended his move. Example: Green moves his farmer from the windmill blade with oranges. Here now stand 3 farmers, so Green must move his farmer 3 spaces clockwise. He ends his move on the windmill blade with almonds, where now 3 farmers stand. He takes 3 almonds from the supply and ends his turn. If the supply does not have sufficient fruits (there are 18 of each kind) of the kind the player is allowed to take, all players (including the player taking fruit) must return all fruits of this kind back into the supply. The player then takes the number of fruits of this kind he is allowed from the supply. Example: Green may take 3 almonds from the supply. However, there are now only 2 in the supply. Therefore, all players, including Green, return all the almonds they have to the supply so that there are now 18 almonds in the supply. Now, Green takes 3 almonds from the supply. When a player moves his farmer past one of the two dividing lines of the windmill (see example below), the player also takes one donkey cart from the center of the windmill, placing it in his play area. Example: the Blue farmer stands alone on a windmill blade with almonds. He moves 1 clockwise space forward to the blade with figs, crossing the dividing line as he does. He takes 2 figs from the supply and 1 donkey cart from the center of the windmill, placing all 3 in his play area. If there are no more donkey carts in the center of the windmill, all players, including the player who moved his farmer, must return all donkey carts back to the center of the windmill. The player then takes the donkey cart he is allowed. Example: Blue may take a donkey cart, because he crossed the dividing line of the windmill. However, there are no more donkey carts in the center of the windmill. Thus, all players, including Blue, must return all their donkey carts to the center of the windmill, so that all donkey carts are back in the center. Now, Blue takes 1 donkey cart from the center of the windmill, placing it in his play area. Rare case: when a farmer crosses both dividing lines because there are more than 6 farmers on the wind- mill blade he moves from, the player takes 2 donkey carts. By moving the farmers on the windmill blades the players take fruits and donkey carts. Later, players can use the donkey carts to deliver fruits to the communities. What fruits each community wants are shown on the face-up fruit tile in each community. This symbol on fruit tiles indicates any single fruit kind can be used to fulfill the fruit requirements of the tile.The player must supply the number of fruits shown. 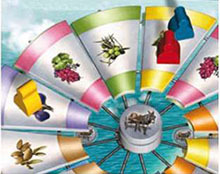 During his turn, the player can deliver fruits to one or more communities, however the maximum number of fruits a player can deliver in a turn is 6 fruits. In order to deliver, the player first returns one of his donkey carts back to the center of the windmill. Then, he places the fruits required by the communities he wants to deliver to on the fruit tiles standing on those communities. The player must place exactly the fruits required - no more and no less. He is, however, limited to delivering a maximum of 6 fruits in a single turn. After the player has delivered all the fruits he wants, he places the delivered fruits back in the supply and takes the tiles they rested on, placing them face-up in his play area. Then, he turns over the top- most tile on each stack that he removed a tile from. Thus, during the game, these stacks become smaller and smaller, and, naturally, not at the same rate. So, some stacks will be exhausted before others. 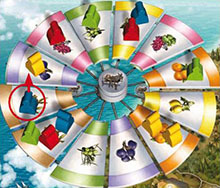 Example: the player returns one of his donkey carts back to the center of the windmill and delivers the following 6 fruits: 1 fig to Arta, 1 olive to Villafranca and 4 lemons to Son Severa. He first places the fruits on the fruit tiles on the indicated communities. Then, he moves the 6 fruits into the supply from those communities and takes the 3 fruit tiles from the tops of the stacks on those communities. Finally, he turns over the top-most tile in each of these stacks. When a player takes the last fruit tile from a community, the Finca tile for this community is immediately assigned to a player. To determine which player gets the Finca tile, each player counts the fruits of this kind he has on the fruit tiles he has collected in his play area. The player who has the most fruits of that kind on his fruit tiles, takes the Finca tile. If two or more players tie with the most, the Finca tile is returned to the box with no player taking it. For example, if the Finca tile shows figs, all players count their figs. After the Finca tile is assigned or returned to the box, the player places a wooden finca on the community to show that the Finca tile has been taken. Example: in Arta, the last fruit is taken so the Finca tile there is immediately assigned. Each player counts the number of oranges on the fruit tiles he has in his play area. Green has 4 oranges, Yellllow has 1 orange, and Red has 6 oranges. As Red has the most oranges, he takes the Arta Finca tile and places it face up in his play area. 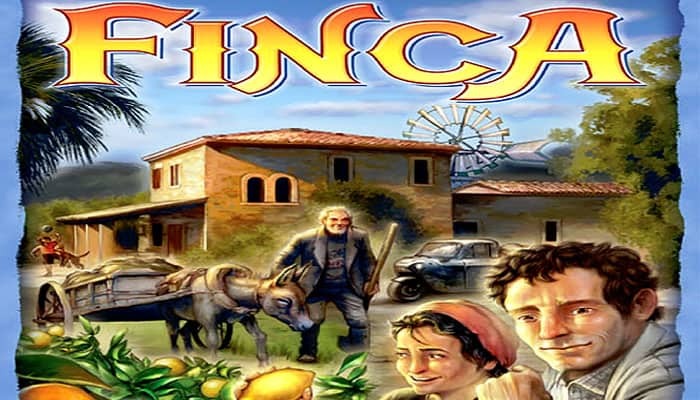 After this assignment of the Finca tile, the player places a wooden finca on the community. There are also Finca tiles with 2 kinds of fruit (e. g., figs and almonds). When such a tile is to be assigned, the players count all fruits of these two kinds on the fruit tiles in their play areas and sum the two to determine who has the most. E. g., the player who has the most figs and almonds together takes the tile. One of the 10 Finca tiles shows this fruit symbol. When this Finca tile is to be assigned, the players sum the values on all their collected fruit tiles in their play areas. The player who has the highest total on his fruit tiles takes the Finca tile. As with the other Finca tiles, if two or more players tie with the most total fruits, no player takes the Finca tile and it is returned to the box. After the assignment of a Finca tile, the player places a wooden finca on the community. This is to clearly indicate that no more fruits can be delivered to this community. Additionally, the placement of the last wooden fi nca signals the end of the game. Each player has 4 action tiles. A player may use one action tile during a turn, but may use each tile only once in the game. After using a tile, the player returns it to the box. 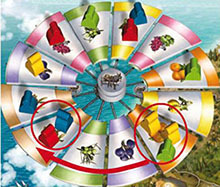 Double move on the windmill: after moving a farmer and collecting fruits, the player may move one of his farmers again on the windmill (the same or another) and collect fruits as in a normal move. In this way, the player could get more than 1 donkey cart in a turn. Gust of wind: the player may place one of his farmers on any blade of the windmill. Then, he takes the allowed number of fruits. However, the player may not take a donkey cart regardless of how far he moves the farmer. Large donkey cart: the player may make a delivery of up to 10 fruits by using this special donkey cart. When a player uses the large donkey cart, he does not use a normal donkey cart. One fruit less: the player may deliver 1 fruit less than required. Thus, he may take tiles totalling to 7, since he is only actually delivering 6 fruits. A player cannot take a fruit tile with just one fruit by delivering 0 fruits of that kind. Note: a player may use only 1 action tile in a turn! The first player to collect 6 fruit tiles with the values 1 to 6, takes immediately the bonus tile with the value 7 on top of the stack of bonus tiles. The next player to do this takes the next tile (with the value 6), and so on until all 4 bonus tiles are taken. A player may take a second bonus tile if he collects a second set of six tiles, valued 1 to 6. The game ends after placing the last wooden finca on the board. The player finishes his turn. Then, the players count their victory points. The player with the most victory points is the winner. and the value of the bonus tiles. If players tie with the most victory points, the player among them with the most fruits in his play area is the winner. If there is still a tie, those tied rejoice in their shared victory. Special case: when the players place the last wooden finca, the player finishes his turn, which may include the assignment of additional Fincatiles, even though there are no more wooden fincas to place. At the end of the player's turn, the game ends.